Airthings, specialists in indoor air quality and producers of the best-selling digital radon detectors on the market, announced the launch of their newest quality monitor, Wave Mini, at CES 2019. The latest addition to Airthings’ growing ecosystem of devices, Wave Mini is an expertly-crafted air quality companion that comes with an entry-level price tag, a perfect starting point for any homeowner looking to gain insight into the quality of their indoor air or as an addition to their smart home system. Wave Mini is a small product with the ability to make a big impact. As an extension of Airthings’ existing line of smart radon detectors and air quality monitors, including the award winning Wave Plus and the brand’s flagship Wave, the Wave Mini provides insights into three critical air components: total volatile organic compounds (TVOCs), temperature, and humidity, allowing you to visualize any changes or comfort levels in every room of your home. VOCs are common toxins and potentially-harmful chemicals that are omnipresent in indoor environments, typically caused by human-made pollutants like aerosol sprays, paints, fumes, cleaning products and even humans themselves. Viewing current and historical measurements is easy with the free Airthings mobile app and online dashboard where you gain a full understanding of the air quality levels in every room, giving you the power to take the most effective action. 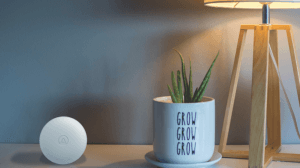 The Airthings Wave family of products connect using Bluetooth or Airthings Smartlink to the Airthings Hub, and integrate with Amazon Alexa, IFTTT, and most recently, Google Assistant, allowing for a fully customizable smart home experience. Wave Mini will be available for pre-order throughout Europe and the US beginning January 31st with an MSRP of $79 USD. Visit Airthings at CES 2019 in the Smart Home area of the Sands Hotel, Booth #40549.